Been quite a while since I last put a face on my lunch. Must remember to do that more often, it’s really effective in brightening an otherwise dull day. This lunch features grilled pork (liempo), steamed squash, and green beans sauteed in olive oil, salt and lots of garlic. The happy little fellow, possibly a puppy, is a fried fishcake with nori details for a face. I made a small slit on his side; it was supposed to be a hand, so he can hold the flag but it looks more like an ear, doesn’t it? Yes, yes. I’m very silly bento preparer. I don’t even know what I made. The thing is, a lot of times, I prepare the decorative parts on the fly so things just happen. Now, say baibai to the little puppy folks! Time for lunch! 12 Responses to Puppy in my Lunch-y! 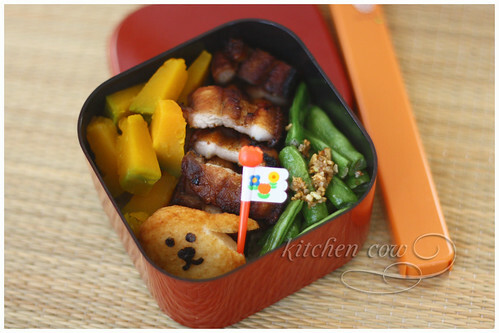 I miss seeing cute faces in your bento! Oooh, maybe next time you can cut out nori speech bubbles for them LOL. Comic strip bento. looks like a yummy lunch. love the puppy face! Puppy cute!!! Gosh, I don’t think I can eat that adorable thing. Like I said before, how can you possibly eat something so cutely smiling at you? I’ll be so tempted as I love fish cakes but I’ll definitely feel guilty munching on such a cutie fish cake puppy! Maybe it would help to pick out the face details before munching? Or just keep your eyes closed, heehee. healthy food. love your lunchbox. Hello Kitchen Cow! It is great to find a kindred bento loving soul in the Philippines. Just wanted to tell you about our online bento box store at http://www.inbento.co . Although we are based in Japan, we have a lot of bentos that are stored in Manila, Philippines. So, we can arrange for domestic rates for orders from the Philippines! Hope you can visit our store! And keep up the great bento blogs! Hi Charmaine! Saizen is your best bet, but you can find some at Daiso / Japan Home Center too. Choto Stop at Little Tokyo is also worth a visit since they also carry accessories sometimes. Good luck hunting!